Angus Kirkland and Judy Kim, the core team leading the Correlated Imaging theme at the Rosalind Franklin Institute, have approved the latest development stage of the institute’s time resolved TEM. 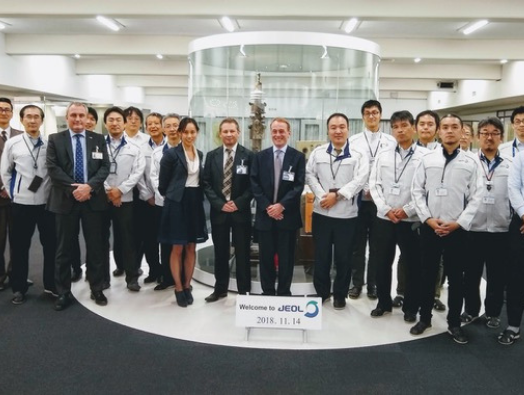 The unique microscope is being developed in Japan by leading technology firm JEOL. The ambitious project will allow researchers to image biological material at temporal resolutions suitable for studying structural changes. This will allow the team to create real space movies of protein folding, mapping dynamic process such as synaptic activation, and the assembly of protein complexes. The team have signed off on all components of the new electron optical column design for the microscope. Work to produce biological samples to make use of the microscope is ongoing across the UK, with teams at KCL, Imperial and Manchester developing research programmes on diverse subjects, from the uptake of metals by plants in contaminated ground, to the deep understanding of neurons and brain function.